Usually our sea animals bask in the 5 star luxury of their home tanks on the Sunshine Coast, where everything is carefully monitored to create an optimum environment, but when they hit the road to educate our next generation of ocean lovers, things get a little more tricky. Our touch tanks are a home away from home for our animal ambassadors and we work hard to ensure things are as stress free as possible while they play a vital role in helping children understand and appreciate the aquatic world. They travel all over Brisbane and the rest of South East Queensland, visiting early learning centres, schools and shopping centres, giving youngsters the opportunity to get up close and personal with these exotic creatures. Under careful supervision, children are able to gently interact with our sea stars, sea cucumbers and spiny urchins, using our one finger touch policy that ensures our animals remain relatively undisturbed while cocooned in their cases. To protect both animal and young enthusiast, our baby sharks are carefully contained in see through containers which allow for thorough inspection without causing damage. Likewise, the colourful tropical sea cucumbers have such delicate feeding tentacles, they need to be kept clear of probing fingers. But the fresh water turtles are only too willing to subject themselves to some soothing shell massage, all in the name of fostering a greater human/animal relationship. We limit the amount of time our animal ambassadors spend away from their homes, rotating our starfish, cucumbers, urchins, sharks and turtles to make sure they are well rested and fed before embarking on their next mission to help save the oceans. 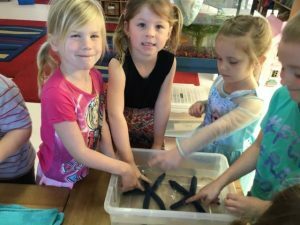 This entry was posted in Early learning, Marine Education, Uncategorized and tagged Early learning incursions, Ocean Life Education, school incursion, touch tanks, tropical sea cucumber on October 8, 2018 by oceanlifeeducation.